I must embarrassingly admit that I’ve never played a Metal Gear game before, though that’s partly because the series has focused exclusively on console and portable gaming devices for much of its existence, only recently becoming a regular release on PC. Created by Hideo Kojima and developed and published by Konami, Metal Gear debuted almost three decades ago in 1987 on the MSX2 (a 3.58MHz computer). Since then, MGS has often only been available on PlayStation with Metal Gear Rising: Revengeance being the first modern title to hit PC, though it arrived a year after its launch on the PlayStation 3 and Xbox 360 so it didn’t exactly make waves. That same year, Metal Gear Solid V: Ground Zeroes arrived but was also delayed on PC for nine months after being released on console. The extra time ensured that the game looked noticeably better on PC thanks to additional lighting, shadows, higher resolution render targets and shadows as well as increased detail over distances — not to mention that it could be played at 60fps and supported resolutions up to 3840x2160 (4K). The end result was a breathtaking game that we admittedly overlooked. That said, the 60fps lock and the huge delay to PC were probably factors in our decision to skip a performance review of that release (the frame rate lock is also why you don’t see the game being used widely to test the latest GPUs). Now almost a year after Ground Zeroes hit PC we have a new Metal Gear Solid V title and this time around it shipped simultaneously for PC and console players on September 1. 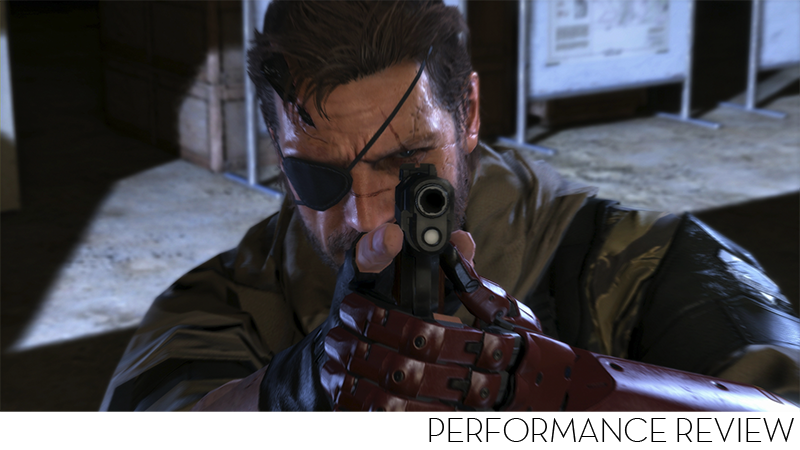 Metal Gear Solid V: The Phantom Pain was built using the same Fox Engine as Ground Zeroes so you can expect to see subsurface scattering, physically-based rendering and other impressive technologies. We expect stunning visuals as Konami recommends an Intel Core i7 and GeForce GTX 760 — interestingly, no AMD hardware is mentioned and you can probably thank Nvidia’s influence for that. Using the latest AMD and Nvidia drivers, we tested 26 DirectX 11 graphics cards covering most price ranges. Our test rig was outfitted with an Intel Core i7-5960X to remove CPU bottlenecks that could influence high-end GPU scores. Using FRAPS we recorded 120 seconds of gameplay. The benchmark was recorded while riding a horse through the desert, taking out some enemies along the way. Metal Gear Solid V: The Phantom Pain was tested at three resolutions: 1920x1080, 2560x1440 and 3840x2160 using the maximum in-game quality settings. Features such as motion blur, volumetric clouds and depth of field were all enabled while the following options were all set to ‘extra high’: model detail, textures, texture filtering, shadows, lighting, post processing, effects and ambient occlusion. Those looking to play The Phantom Pain at 1080p will get away with relatively low-end/dated hardware. The nearly four year old HD 7950 averaged 48fps with a minimum of 38fps (very playable) while the new GTX 950 provided a strong average of 52fps with a minimum of 40fps . Nvidia has a clear advantage in this title at the moment and that can be seen when making numerous comparisons. The GTX 950 for example was 33% faster than the R7 370 when comparing minimum frame rates and the GTX 970 was just a single frame slower than the R9 390X. Older GPUs that Nvidia and AMD seem to have stopped supporting or at least optimizing we should say still managed to provide competitive performance. For example, the GTX 680 was on par with the 7970 GHz Edition. Running at 1440p scrubbed out the lower-end cards. The HD 7950 was good for just 30fps on average with a 24fps minimum. To maintain at least 30fps or more at all times you’ll need at least a GTX 680 or GTX 960 from Nvidia or R9 290 from AMD, though the R9 380 did come close with a 28fps minimum. Nvidia’s big guns were still able to reach the 60fps limit and while the GTX 980 was good for 60fps on average, it did drop down to 51fps at times. The older GTX 780 Ti and GTX 780 performed well here and we’ve become used to seeing the GTX 780 rubbing shoulders with the GTX 960 lately rather than the GTX 970. The R9 390X was slightly slower than the GTX 970 and GTX 780. Sorry for the absence of the Fury X and Fury graphics cards but AMD can’t send us samples at this point and we can’t even buy them.